Tom Riley and Debbie Stebenne have owned the Sea Spray Inn since July of 2001. Ever a work in progress, the inn has flourished under their care. The inn is well on its way to becoming a top notch bed and breakfast. 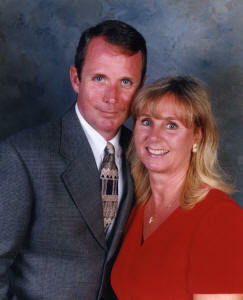 Tom and Debbie both hold advanced degrees and are both veterans of many years in Corporate America. After marrying in 1992, Tom and Debbie began building a real estate portfolio that spans four states. These are pictures of our dogs. Neptune (pictured on the left) owns the company that owns the property. We, in turn, own Neptune. Lucy (pictured on the right) owns us.